Metal Cutting Disc 115mm x 2.5mm x 22.2mm centre. All-purpose metal cutting disc, suitable for ..
Metal Cutting Discs 230mm x 3mm x 22.2mm centre. All-purpose metal cutting disc, suitable for ..
Metal Cutting Disc 300mm x 3.5mm x 20mm centre. All-purpose metal cutting disc, suitable for cu..
An excellently priced diamond blade A dry cutting blade with key hole gullet design for le..
Stone Cutting Disc 230mm x 3mm x 22.2mm. Suitable for cutting all types of material found on th..
Stone Cutting Disc 300mm x 3.5mm x 20mm. Suitable for cutting all types of material found on th.. 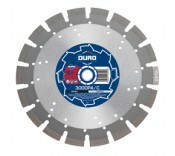 This asphalt diamond blade is designed to cut asphalt dry or wet with 10 mm segment height. Las.. Concrete and Asphalt Laser-welded blade with a wide gullet design with conical segments for low..